Treasures of the East: Skinner’s September Asian Works of Art Auction Offers Alluring Jade, Cloisonné, and Textiles | Skinner Inc.
Jade, considered the most precious material in Chinese traditional culture, is believed to promote wisdom, balance, and peace. This revered mineral, with its rich mystical significance, is used to create artifacts that exhibit the finest craftsmanship of great artisans. • Jade Carving of a Mythical Bird standing on a leaf with a peony blossom in its mouth (Lot 296, estimated between $2,000-3,000). 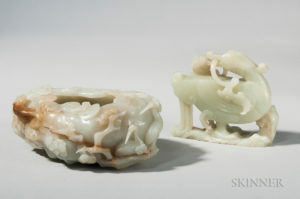 • Translucent White Nephrite Jade Plate, 19th century (Lot 304, $2,000-3,000). Another distinguished jade object is a ruyi scepter, a decorative carving associated with Chinese Buddhist beliefs and a talisman of power and good luck in Chinese folklore. • Jade Ruyi Scepter, in the shape of a gnarly branch intertwined with open work lingzhi mushrooms, the head with pomegranate seeds and an open work chilong, celadon stone with yellow tint and russet markings (Lot 246, $10,000-12,000). Cloisonné, the ancient decorative technique of applying colorful enamels to a metal base and then firing the completed object in a kiln, reached exceptional heights in China. Judith Dowling, Director of Asian Works of Art, notes that this auction includes an outstanding quantity and variety of fine cloisonné objects. 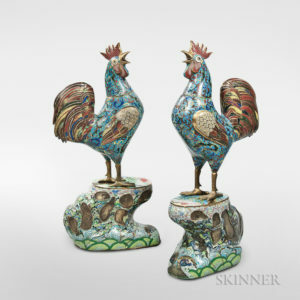 • A Pair of Large Bronze and Cloisonné roosters, China, 19th/20th century, each with upturned head and open beak, standing on a rock base with a red sun (Lot 333, $20,000-30,000). Other fine expressions of cloisonné artistry include a pair of crane censers, each bird holding a peach branch (Lot 336, $500-700) and several examples of jade and hard stone flowers in cloisonné containers. There is increasing interest in textiles among collectors and connoisseurs, in large part because of the growing recognition that the traditional skills that have created the legendary excellence of Asian textile arts are disappearing. The Kingfisher Manchu woman’s headdress is a notable example. It includes numerous phoenixes, a reference to the empress, with many auspicious symbols. The workmanship is superior, and it is complete with four hanging pearl, semi-precious and Kingfisher feather attachments. Most often these attachments are lost (Lot 429, $3,000-5,000). 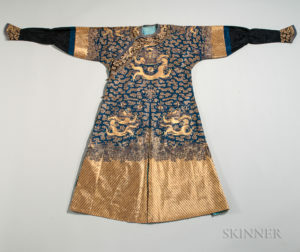 Other noteworthy textiles include a Chinese semiformal silk robe with satin embroidery depicting dragons, cranes, bats, and clouds (Lot 430, $2,000-3,000); and a Japanese uchikake kimono from the 18th/19th century embroidered with red, green, and metallic threads depicting symbols of longevity (Lot 451, $800-1,000). • Portrait of a Princely Man, Persia, 19th century, possibly of Qajar dynasty, seated in a chair on a carpeted floor, with a book in his left hand (Lot 5, $800-1,000). • Hanging Scroll Depicting a Monk Playing the Flute, Japan, Isamu Noguchi (1904-1988) (Lot 467, $3,000-5,000). • Shiko Munakata (1903-1975) Woodblock Print, Japan, dated 1960, depicting Subodai, Master of the Immaterial, from the series Ten Great Disciples of Buddha (Lot 470, $3,000-5,000). Many more examples of the intriguing arts of Asia are to be found in this auction, including ceramics from China, Korea, and Japan; fine metal wares, including several Japanese Meji-period mixed metal objects; and an extensive assortment of Peking glass vases and snuff bottles. Public auction previews will be held in Skinner’s Boston gallery, September 13 from 12PM-5PM, September 14 from 12PM-7PM, and September 15 from 9AM-10AM. The print catalog is available for purchase from the Subscriptions Department at subscriptions@skinnerinc.com. Prices realized will be available at www.skinnerinc.com during and after the sale. The Skinner website enables users to view all lots in the auction, leave bids, and bid live, in real-time through SkinnerLive! This entry was posted in News and tagged Asian Art, asian art auction, asian works of art, boston, China, Chinese art, Chinese books, Chinese ceramics, Chinese painting, Chinese textiles, jade, Japan, Japanese art, Japanese print, Judith Dowling, Korea, Live Auction, netsuke, scroll paintings, skinner, skinner auctions, woodblock print by Skinner. Bookmark the permalink.